Setting of the 1746 Town Hall based on the 1843 Tithe Map. Proceeding down Church Street one comes to a mini roundabout at the junction of Church Street, Wick Lane, High Street and Castle Street. This is the site of the one time Market Square with all of the historic connections that there are at this point. The drawing opposite is taken, by courtesy of the author and publisher, from the book ‘Old Town Halls of Christchurch’2 by W A Hoodless and published by Natula Publications. The drawing shows a diagrammatic representation of what the plan of the Market Square was most probably like in 1843, based on the Tithe Map available in Christchurch Priory. 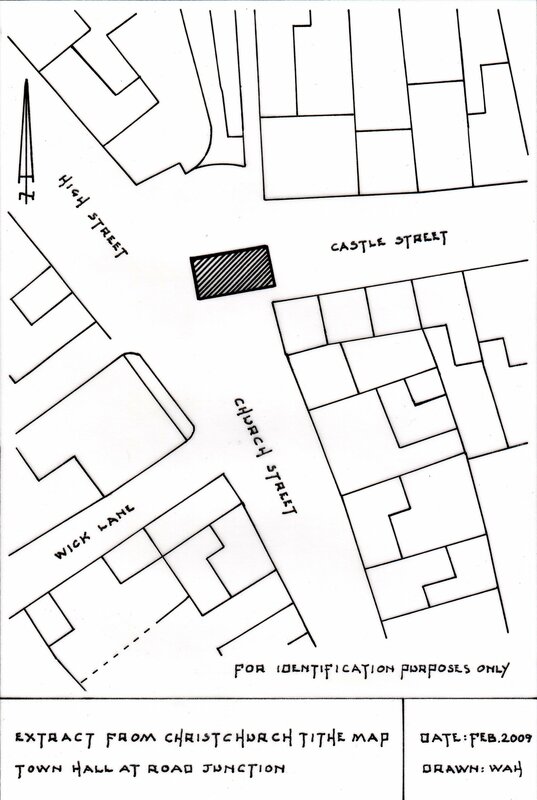 The hatched rectangle shows the position of the Old Town Hall and its proximity to the various buildings at the junction of Church Street, Wick Lane, High Street and Castle Street and its undoubted obstruction to the flow of the vehicles of the time. More details of the Old Town Hall are given on the High Street Historic Walk by following this link. 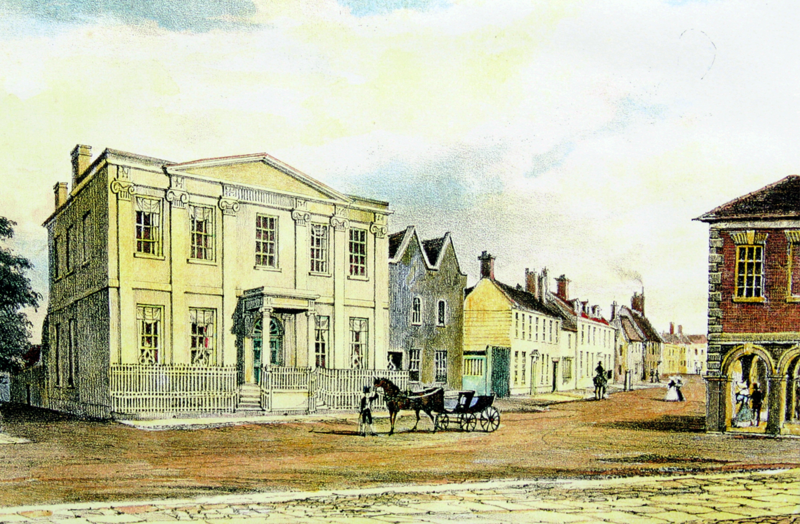 In 1859 the Town Hall was moved because of the increase in traffic which resulted from the railway’s arrival at Holmsley, some seven miles away, in 1847, to Blanchard’s Yard in the High Street. When it was in the Market Square the Hall only gave eleven feet clearance which was the cause of traffic jams for horse drawn coaches and wagons. At this focal point of the town once stood Square House, to the south west of the Old Town Hall on the corner of Wick Lane facing the site of the old Market Square. It was actually in Church Street but when the High Street was numbered in 1895 it became number No.1 High Street. Square House was a superb Palladian Mansion, built in 1776 by a wealthy brewer called John Cook. The Cook family had been brewers in Christchurch since the early part of the eighteenth century but it was John Cook who seemed to flourish. When the business was sold by John’s son in 1796 the sale included the Dolphin on the opposite side of Church Street, The House was a grand building with Adam’s ceilings and fireplaces. There were two parlours, the cook’s kitchen, an outer pantry, kitchen, housekeeper’s store room, servants hall, butler’s glass room, small parlour adjoining a main bedroom with adjoining dressing room and five other bedrooms. Courts was on the right of the arcade and Fine Fare, which was the first supermarket in Christchurch, was on the left. To the right hand side of the picture above can be seen the corner of the Town Hall which was built in the Market Square in 1746. The next owner was John Spicer, who lived in the house until 1838, when it came into the possession of James Druitt. 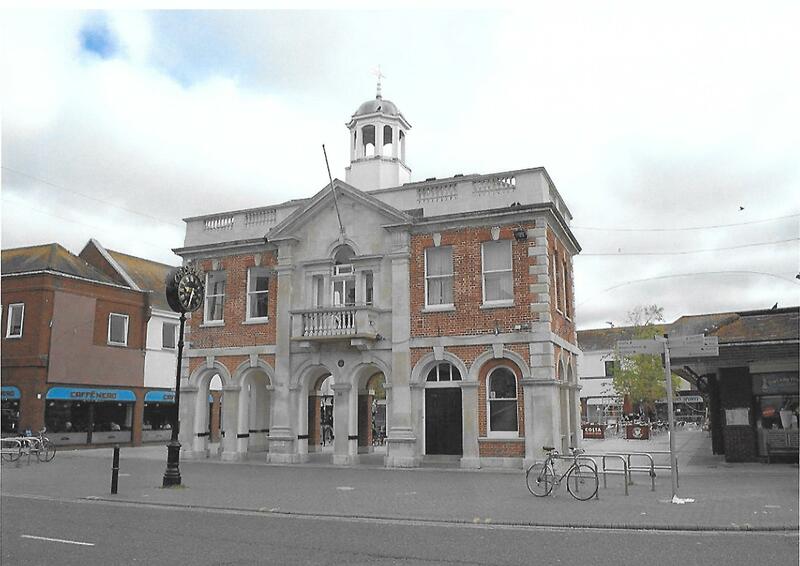 In 1845 the House and brewery were sold to King and King who were brewers in Poole. It was subsequently bought by the brewers ,Strong and Co., in 1891. Strongs sold the house to Dr William Hartford. After his death it passed to his son Dr A H Hartford, and when he retired it was leased for twenty-one years to the Medical Officer of Health at a rent of £120 per year. Therefore in its heyday the Square House was the headquarters of an extensive public house chain stretching along the south coast and almost certainly built with the fruits of the thriving smuggling trade. During the Second World War it was used by the Red Cross and the Civil Defence. After the war the building was used as a day nursery and allowed to fall into disrepair until it was demolished in 1958. 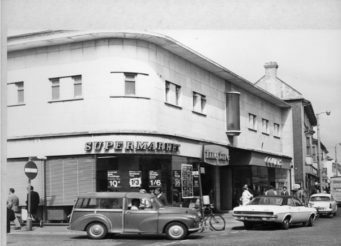 By the early 1970’s the site was occupied by a furniture store and Christchurch’s first supermarket, Fine Fare. 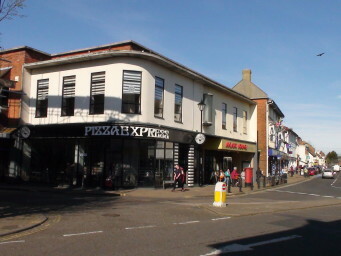 Redevelopment has continued and now Pizza Express are on the site. On the Christchurch Blue Plaques Millennium Trail Leaflet1 this location is identified as number 33. The next building on the left going up the High Street is now Bookends but is the site of the house which John Clingan gave in trust to benefit the poor but is has been rebuilt. From 1760 until 1936 it was the premises of G Ferrey and Son the drapers. 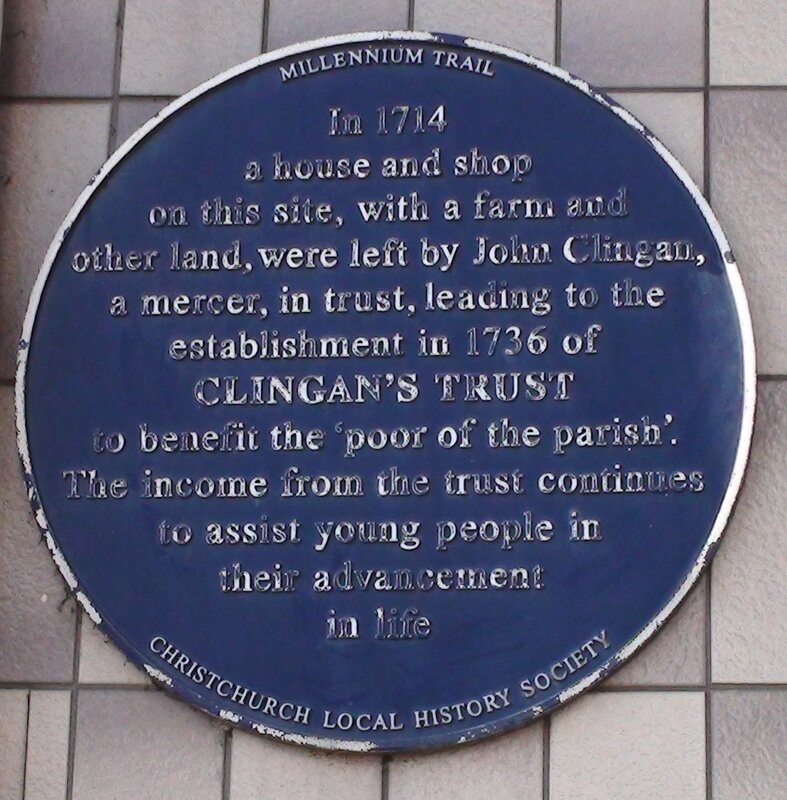 Cligan’s Trust set up in 1736, which still exists, provides funds to help equip young people with tools or technical books to aid them in finding work. When first set up the Trust was used to fund apprenticeships for local children in occupations including shoemaking, dressmaking, tailoring and carpentry to a life on the high seas as mariners. On the Christchurch Blue Plaques Millennium Trail Leaflet1 this location is identified as number 34. 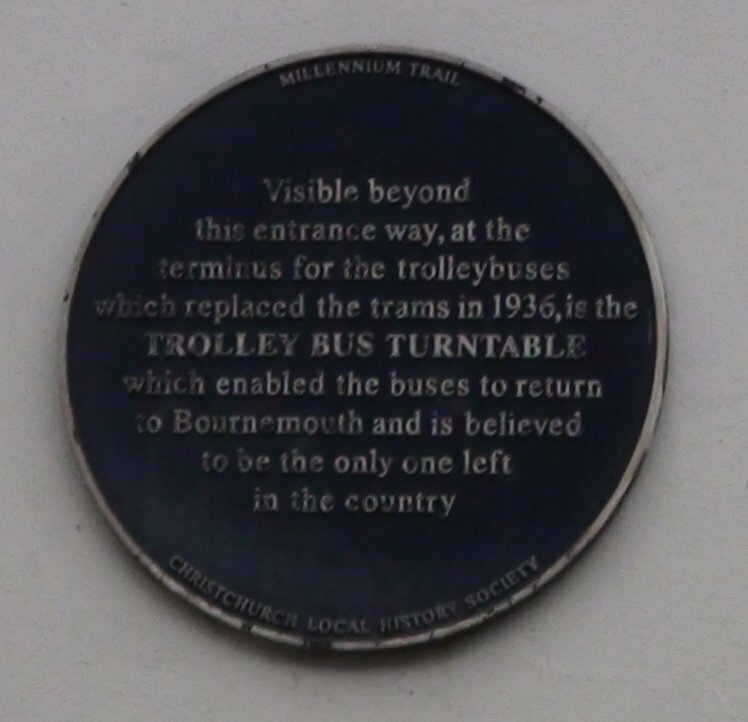 Between 1902 and 1938 trams ran down the High Street from Bargates having come from Poole over Tuckton Bridge. When trolley buses took over from the trams, a network of overhead wires was put in place above the roads to provide the power. In order to facilitate the turning of the trolley buses the large vehicles were pulled around on grooves in a turntable manually. The turntable was actually in the yard of the Dolphin Hotel in Church Street, now demolished. 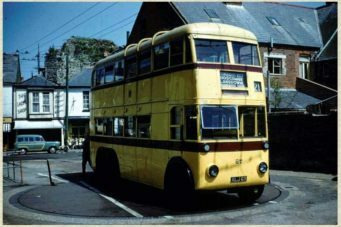 The trolley buses made their last journeys in 1969 but when the Dolphin Development was planned the turntable was retained and is normally still visible through a gateway 30 metres down Wick Lane on the left. 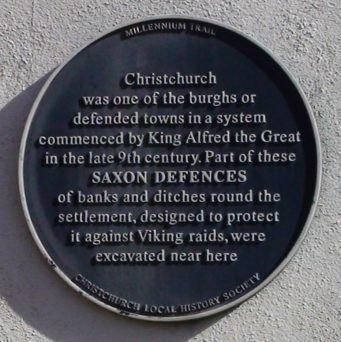 Christchurch was protected in Saxon times by a wall with a defensive ditch on the outside. There is little physical evidence today of the defences that were built by King Alfred to keep the Vikings out around 886. The troops manned a fighting platform on top of a wall with a palisade fence on the top. In front of the wall were two ditches, the wall was built of turf laced with timber. At some time the wall was faced with ironstone. The wall is believed to have run from the Mill Stream north of Christchurch, turning through ninety degrees to run through what is now the Druitt Gardens, to near the site of the plaque, which was the end of the Saxon town wall because at that time the river Stour came up to where you are standing. On the Christchurch Blue Plaques Millennium Trail Leaflet1 this location is identified as number 25.